When you sit back and think about it for a minute, marketing is simply bribery in different clothing. Brand X offers consumer Y something in exchange for consumer Y's action be it purchase, use or measurable affinity. 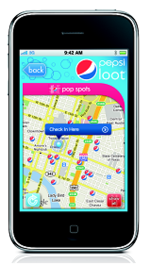 Now, we're not saying Pepsi is bribing people with its new iPhone app, Pepsi Loot (iTunes link), but it is offering people loot in the form of free songs in exchange for a visit to a restaurant that serves Pepsi. And the participating restaurants can make offers through Pepsi Loot, such as a free Pepsi with purchase of an entrée. The app is Foursquare-powered and takes on the form of a map which shows Pop Spots or locations that sell Pepsi. In addition to nabbing free music, videos from the contributing bands (Neon Trees, Tamar Kaprelian, Semi Precious Weapons and others) can be viewed on the Pepsi Loot YouTube channel. People like music. People like free music even more. People like Pepsi. People like to go to restaurants. What's not to love? Oh right. The fact this will only work for those who own an iPhone. Then again, who doesn't? And does anyone care? It certainly doesn't seem so when you take a look at where all the mobile marketing money is going.